In a hurry? Go directly to "The best hotel and apartment locations." For visitors on a tight budget, it might seem that the question of where to stay in Venice is best answered with the word "Don't." It's true that Venice's hotels have a reputation for being more expensive than their counterparts in other Italian cities, or in the popular mainland suburb of Mestre. Every towel, bar of soap, roll of toilet paper, bag of coffee, and loaf of bread must be delivered to your Venetian hotel by handcart or boat. Sewage may be stored in an underground cesspit and removed by barge. 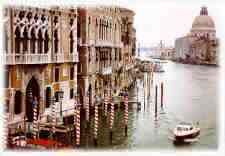 In short, running a hotel in Venice is an expensive proposition, so it shouldn't be surprising that Venetian hotel rates aren't cheap. Still, there is some good news: Quoted rates include VAT. Breakfast is often included, too. When it isn't, you can save on breakfast by having your coffee and croissant at the counter of a neighborhood bar or café. Many of the links on our accommodations pages point to hotel Web pages at our affiliate partner, Booking.com, which is Europe's leading secure reservations service. Rates from Booking.com tend to be lower than official hotel "rack rates," and if you're lucky, the hotelier will upgrade you when a better room is available (since hoteliers know that booking sites invite their customers to rate hotels or submit reviews). Booking.com represents nearly all Venice hotels, and it even has a local office in Venice. The city of Venice charges a tourist tax that averages several euros per night, per person, for the first five days at a hotel, B&B, hostel, or vacation apartment. The exact amount depends on location, the class and type of accommodation, and other factors. Unlike VAT, the tax is added to your bill instead of being included in the rate. At many hotels, you'll need to pay it separately in cash, so it's a good idea to have some euros on hand when you arrive at the hotel.